After machining and assembling the differential, the backing plates are attached with our Bearing Adapters. The bearing adapters bolt to the backing plate and axle housing. The axle fits into the bearing adapter and is held in by the axle bearing retainer. These pieces come with each axle conversion system where the early Ford style backing plates are retained. 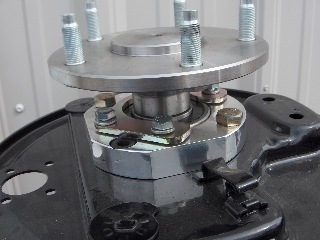 When the early Ford drum brake system is retained, the hub must be removed from the drum. Only the ’40 style drums can be used. These drums were attached to the outboard side of the stock hubs. The new axle flange and pressed on axle bearing take the place of the original early Ford hub.